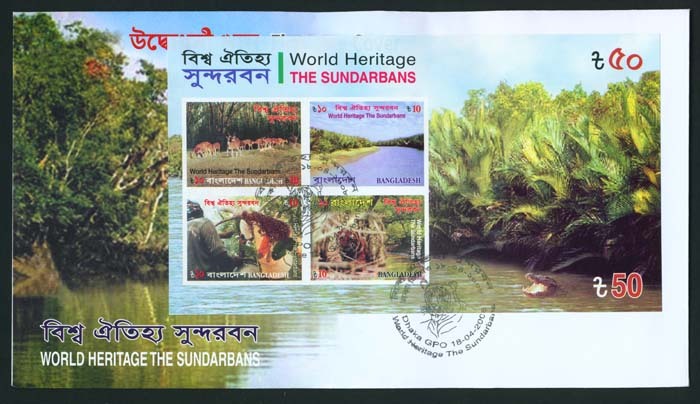 World Heritage - the Sundarbans M/S Imperf. Welcome to AAS New Issue service for stamps of Bangladesh, Nepal, Qatar, Worldwide. Search new issue by Country or Topic/Theme world wide. The Sundarbans (the beautiful forest or forest of Sundari trees) is the largest single block of tidal halophytic mangrove forest in the world. It got inscripted as a "UNESCO World Heritage Site" in 1997 and was designated a "Ramsar Site" in 1992. The Sundarbans is a cluster of islands forming the largest block of littoral forest, located in the southwest corner of Bangladesh. It lies on the Ganges -Brahmaputra Delta at the point where it merges with the Bay of Bengal. The forest lies a little south to the Tropic of Cancer between the latitudes 21°30'N and 22° 30' N, and longitudes 89° 00' E and 89°55' E.
The Sundarbans was originally measured (about 200 years ago) to be about of 16,700 sq km. Now it has dwindled to about 1/3 of the original size. Because of the partition of India. Bangladesh received about 2/3 of the forest ; the rest is on the Indian side. It is now estimated to be about 4,110 sq km, of which about 1,700 sq km is occupied by waterbodies. 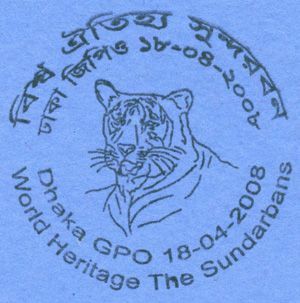 The Sundarbans is bounded in the north by Bagerhat, Khulna and Satkhira districts, in the south by the Bay of Bengal, in the east by Baleswar (or Haringhata) river of Perojpur district and in the west by Raimangal and Hariabhanga rivers which partially form Bangladesh boundary with West Bengal. India. The climate in the Sundarbans is moderate. Air is humid. Full monsoon is from June to September. The average annual maximum and minimum temperature vary between 30° C and 21° C. The annual rainfall is in the range of 1640 to 2000 mm. During ebb-tide the forest becomes bare by 6-7 feet and at high tide the entire territory of the forest floats on water. The flora of the Sundarbans is largely of mangrove type. More than 334 species of trees, plants and shrubs grow in this forest. Most trees have pneu-matophores for aerial respiration. The prominent species is Sundari and the others include Gewa. Keora, Goran, Golpata. Passur etc. The Sundarbans also hosts a large variety of animals. Within the forest habitats there are about 50 species of mammals, about 320 species of inland and migratory birds, about 50 species of reptiles, 8 species of amphibians and about 400 species of fish. It is also a centre of economic activities, such as extraction of timber, fishing and collection of honey. Thousands of meandering streams, creeks, rivers and estuaries have enhanced its charms. Sundarbans is the natural habitat of the world famous and ruthless, yet majestic and graceful Royal Bengal Tiger, spotted deer, crocodiles, jungle fowl, wild boar, lizards, rhesus monkey, pythons and an innumerable variety of beautiful birds. Migratory flock of Siberian ducks flying over thousands of sail boats loaded with timber, golpata, honey, shell and fish add to the serene natural beauty of the Sundarbans. With the approach of the evening herds of deer make for the drinking glades, where boisterous monkeys shower keora leaves from above for sumptuous meal for the deer. For the botanist, the lover of nature, the poet and the painter this land provides a variety of wonders for which they all crave. The Sundarbans has been recognised globally for its importance as reservoir of biodiversity. It is an abundant natural resource for a number of leisure, travel and research activities. With its array of trees and wildlife the forest is a showpiece of natural history. A visit to Bangladesh would remain incomplete if the Sundarbans did not appear in the Itinerary. The noteworthy beauty spots of the Sundarbans are Katka, Hironpoint, Kachikhali; Dublar Char (Island), Tin Kona Island etc. 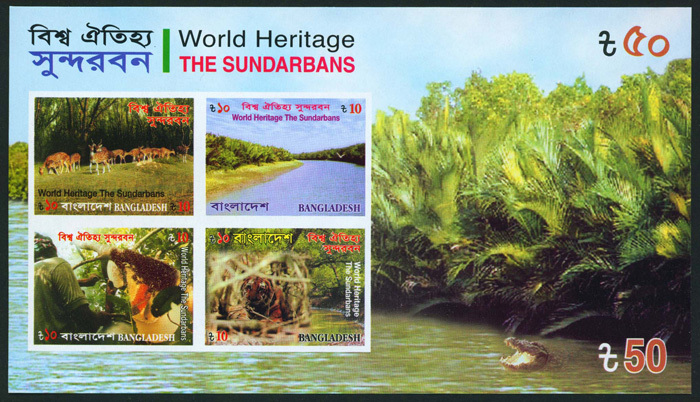 Bangladesh Post Office releases these Commemorative Postage Stamps and Souvenir sheets to present a showpiece of natural history and a world heritage site to the world community in a graceful fashion and the post will continue its efforts to issue stamps on the Sundarbans in future.